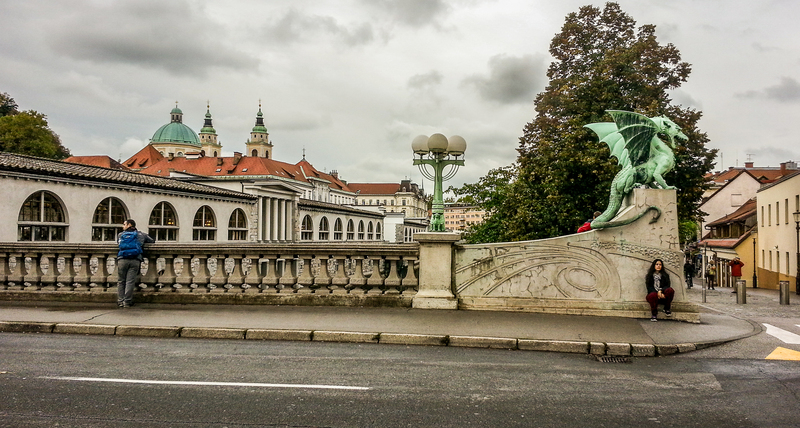 I fell in love with Ljubljana immediately. Ljubljana, the capital of Slovenia, is like a universe unto itself. Artists, architects and politicians have come together to create a city center that flows intuitively, one that is a complete picture of Central European elegance. Walks along the lovely Ljubljanica river reveal stately terraced mansions peeking out behind the weeping willows, and I could see people sipping coffee at riverside cafes or perusing the boutiques. The city center made me feel as though I were slipping through time: the meandering cobbled streets leading away from the river took me through the late middle ages, the many town squares brought me into the 18th century with sophisticated Baroque facades, and the Art Nouveau wonder that is the “Three Bridges” leads to the new town where pastel colored buildings with Nouveau designs converge with the modern and the ancient, bringing me back to the present. The recently pedestrianized old town further creates the feeling that when you are in Ljubljana, you are in Ljubljana. Ljubljana Castle looks down over all of this from its haughty position on the hill above the town. I took a brisk walk up the steep but autumnal path to see this castle that has participated in much of Slovenia’s history: from its days as a Roman fort, to a Habsburg holding, to a barracks, a squatter town, a political prison, and finally, to the cultural center that it is today. It has been reconstructed to appear mostly as it did in the 15th century, but with modern amenities. It houses a castle history museum, a Slovenian history museum (which I must say I found a bit lacking in depth), and an exquisite puppet exhibit. Puppetry was huge in Slovenia in the 1930s. I tried to go to a “Faust” puppet show but alas, they were all sold out. The intricate puppets are on display along with samples of how they move and the types of shows that they used to be involved in. Not only did they entertain children, but puppetry was a great tool for social and political commentary, as the puppeteer could hide behind the mask of his art. One person I spoke to said that while the mayor cleaned up the city and made it shiny for tourists, it was done at the expense of Slovenians; that they don’t feel welcome in the same way before it was overhauled and pedestrianized; that they don’t feel like the city is theirs anymore. I felt this undertone even before I had this conversation. To borrow a phrase from Dostoevsky, Ljubljana is an “intentional city.” Ljubljana’s center is like a jewel. It is very clean-cut and has a sheen over it; even the graffiti seems to fit in by design. There was only one tag that felt like a “real” piece of rebellious graffiti because it was so obviously out of place on the beautifully appointed Cooperative Bank. 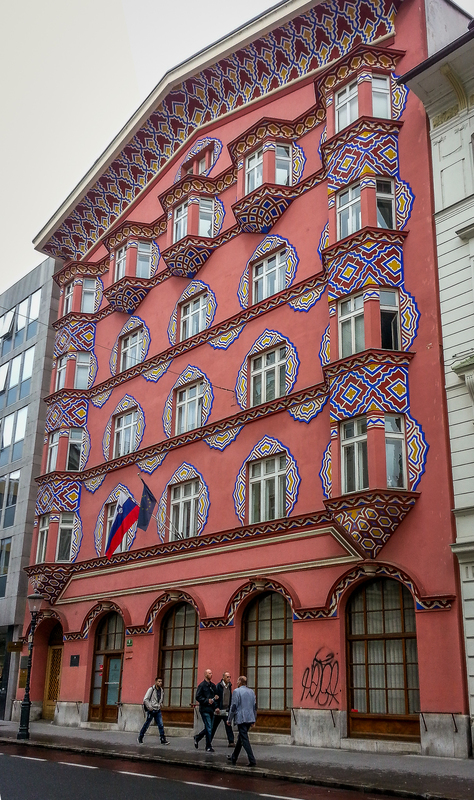 The architect used Slovenian folk motifs in the building’s design and the black scrawl at the bottom is jarring in its incongruity with the rest of this part of town. It brought my mind back to the 21st century and the problems Europe faces today. All of the mayor’s deliberate conceptions of the city have paid off, for tourists at least, for it is one of the most beautiful, charming and comfortable cities I have had the pleasure to visit, and I would love to live there. I did a walking tour of the city and found myself agreeing with the tour guide that while the architects who created the castle in its current state did a great job, they sacrificed some of its “castleliness to its cultural-centerness.” I agree with the guide, I like a castle to be a castle, even if it is refurbished. However, I found this trait all over Ljubljana: major parts of the city are being, or have been, recreated to honor history, but not to be trapped by it. At times it may create a sense of loss of authenticity, like with the castle; however, at other times this reimagining of painful places can be an empowering way to understand the past, while using the creative forces of art to pave the way forward. Nowhere is this more true than in Metelkova Mesto. Metelkova Mesto was the Yugoslav’s People’s Army barracks. After Slovenia left Yugoslavia in 1991, the barracks were abandoned. Then artists and musicians moved in and they have transformed the area from its nightmarish quality to one of hipster relevance. The area is covered in brightly colored street art, mosaics, and sculptures, and is filled with art galleries, bars, and clubs. The old prison has even been lovingly converted into the Hostel Celica. My first visit was during the day so it was very quiet. As I traipsed along taking photos I felt deeply touched by the people who came together and gave this neighborhood its new identity. It must have taken a lot of time and cooperation. Artists and intellectuals have been routinely persecuted in Communist countries so to see the very area where people would have been imprisoned recreated as an artist’s haven made me cry. 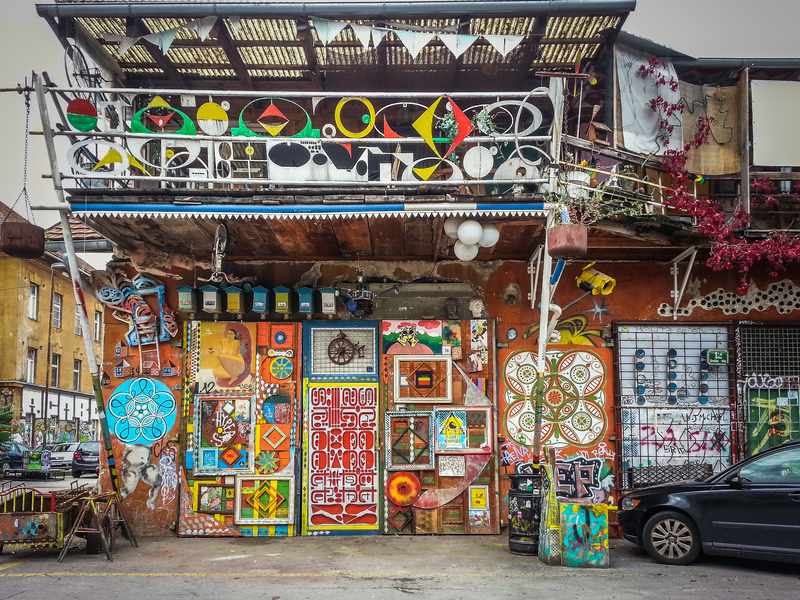 Hostel Celica is the focal point of Metelkova’s history. I was able to go on a tour of the hostel although I didn’t stay there. 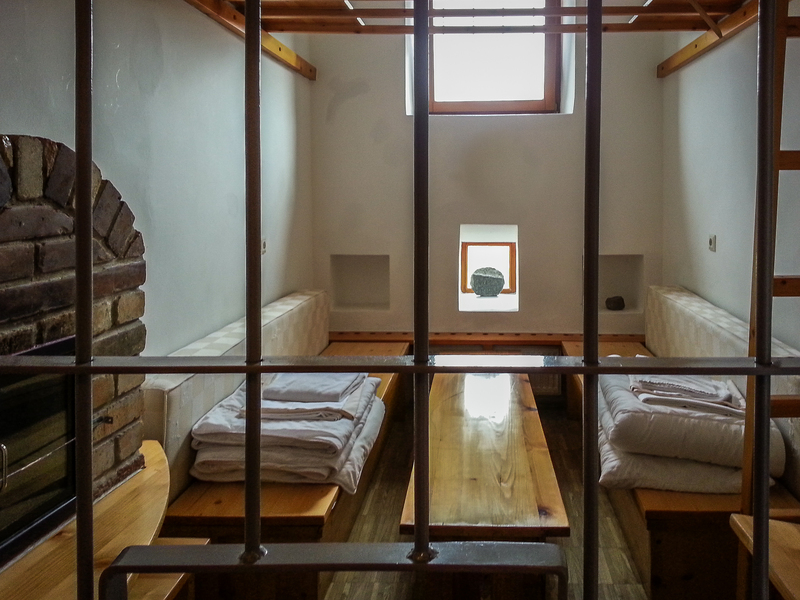 Artists came together and redesigned a lot of the former prison cells to be hostel rooms. Each has a theme, and all have the original cell doors. The rooms are tiny and have the amount of furniture that would have been available to prisoners. The common area has a welcoming sense of community: there is a prayer room with icons for various religions, an art gallery, various themed dining rooms and a bar. In the basement you can see the realities the former prison: dark dank solitary confinement cells. It was strange to come back up to the optimistic party place that is the Hostel Celica. People told me five days in Ljubljana was way too long. I whole-heartedly disagree. This little city is like an onion. Peel its layers and you will continue to find new artistic scenes, beautiful parks, nifty neighborhoods, interesting museums, amazing food… I can’t wait to go back and discover more of its secrets. < Previous ‘Tis the Season to Eat Pumpkin!